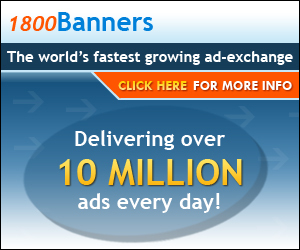 We have some exciting news for 1800Banners.com publishers and advertisers. In this email, you will find some of the latest features we have implemented, along with some specials we have going on. First, our long awaited City/State Targeting is finally completed. We are proud to be the first banner ad exchange to have fully integrated the City/State Targeting. The same service and technology that ad media networks charge hundreds of dollars for, is now available through 1800Banners.com for less than a cup of coffee a day. Our second most exciting feature is the click-through tracker. There are thousands of ad exchanges on the web, but not a single one of them offers any transparency. We are happy to announce that all our ad campaigns come with a full tracking information, including the visitor's IP address, browser type, country, state, and even their city. You will be able to compare your stats directly with ours. Some other minor update includes an improved click-through security system, added campaign management features, and click packages. And finally, we are once again offering a buy-one-get-one-free deal on impression packages: Limit one per customer. Orders over 25 Million impressions have to be approved by the management, please call 1-866-821-4744 if you have any questions. Please note that the B1G1Free does not apply to any click packages, and that the offer may expire anytime due to limited inventory. We have also fixed some minor bugs in the ad display on publisher sites such as the infamous "back button" interference. We are working on adding some additional ad sizes and media types such as 125x125 button ads, interstitial ads and other new features over the next 2 months. Protecting advertisers from click fraud is our top priority at 1800Banners.com. Recently we have deployed new anti-fraud systems that protects advertisers from invalid clicks. Invalid clicks may be a bot, or traffic sent directly to our click url, or someone clicking on multiple ads repeatedly. All click-throughs from 1800Banners are 24-Hour unique PER campaign. No more than 3 clicks TOTAL (1 for each unique campaign clicked) from a single IP can be counted in a 24 hour period. This eliminates/reduces click fraud from users clicking on multiple campaigns on there own websites, or having other people do it for them. Our system guarantees that publishers visitors MUST click on the banner ad for any credit to rewarded. Its not possible to cheat the 1800Banners.com ad click-through tracker url. Publishers may not inflate there impressions by refreshing ads over and over either. Our system tracks traffic from every IP and if it exceeds the allowable amount within a certain time frame that IP address is cut off from earning the publisher any credit as well as deducting from advertisers. We are committed to improving our system so that our publishers and advertisers have the maximum amount of protection that can be offered by our software systems. Link: 1800Banners is committed to protecting its publishers and advertisers. Our new upgrade system will allow users to custom build there own upgrade package instead of choosing pre-made packages, there will also be other features such as a discount system based on subscription cycle chosen and more! Users will benefit from this by only paying for the options they need and not for the options they don't need. Users that are upgraded with these options available will be able to target by city, state and area code. Users that have the city targeting option available will be able to target cities by there median income range (the average income per household in a city). This will be a great benefit to retailers seeking to display ads in high-income cities or low income cities depending on the product they are offering. All upgrades will be announced by email once they are completed. In these economic hard times, finding ways to make every click count in PPC advertising is increasingly important. Dayparting has helped many small businesses maximize their return on paid advertising. Dayparting allows the advertiser to control when ads are delivered by time-of-day and day-of-the-week. The advertiser can turn off paid advertising during periods of low conversion and turn ads on during times when conversions are best. Often this technique can produce higher ROI because it allows you to restrict displaying your ads to times when customers are most likely to convert. If you're a small or local business, it may not make sense for you to run ads and drive traffic during periods when you're not open. Dayparting could be tailor-made for you. Keywords are probably the most important factor to establishing a successful website. When you visit your favorite search engine, their software is using Keywords to decide what websites to show you and in what order to display them on the search results. To a webmaster, profiting off of the popularity of their website through online advertising, keywords are very important indeed. The world of internet advertising changes constantly so it's very important to keep up with trends. We're not saying you should necessarily follow them, but at least know what's going on out there. Infotech websites and magazines are a good resource - they frequently run stories on internet marketing. The following guidelines relate to traditional banner ads but can apply to most forms of online advertising. Conventional wisdom says you should try to grab attention through animation, bright colours, etc. The idea is sound, but be careful. Gaudy is not always good and visitors may be put off by "in your face" ads. Sometimes understatement can work wonders - a subtle ad might actually be what sets you apart.